Everything’s Changed, Except the Anatomy! ENDODONTICS. ﻿﻿﻿﻿﻿L. Stephen Buchanan, DDS, discusses how everything is changing, except for the need to understand the basics of root canal anatomy. Consider the changes that have occurred in our tools — flame-heated carriers to electrically-heated carriers and gutta-percha guns, loupes to microscopes, hand file shaping to rotary file shaping, mini-handpiece heads to ultrasonic retroprep tips, bacterial culturing to DNA identification, analog posterioranterior (PA) radiographs to digital PA radiographs to computed tomography (CT) imaging, paper to electronic charting, and the list goes on ad infinitum. That’s just the new devices and tools that have changed. A list of procedural changes — sodium hypochlorite to lubricants during negotiation, push-pull filing to balanced force cutting with hand K-files, apical stop preps to tapered preps, length determination with radiographs to apex locators alone, big coronal shapes to smaller, controlled coronal shapes, serial step-back shaping with 18 instruments to cutting complete shape with one to 4 rotary files, lateral and vertical condensation to centered condensation, etc. In this article, I will describe a few recent changes in the concepts, tools, and methods that I personally use; some of them are nuances, but a couple of them are huge! The greatest threat to endodontics is not implants; it is poorly done root canal therapy (RCT). The No. 2 threat to the art of saving diseased teeth is the over-exuberant cutting of access cavities and the over-enlargement of coronal root canal shapes. More than any other factor, the structural integrity of teeth remaining after completion of RCT literally determines their potential longevity. My definition of endodontic success is seeing a patient’s name in the local obituary before he or she needs any retreatment of the work that I did. My long-term success and failure experiences in practice have closely mirrored and reason Rud et al’s1 findings; mainly, that if all periradicular disease heals within one year of treatment completion, the case will continue to be successful unless subsequent coronal leakage allows recontamination of the root canal space, or if root fracture occurs. Endodontic treatment or retreatment, except for rare cases, should only be recommended for teeth with good to excellent structural integrity. Therefore, techniques of retreatment that further reduce the strength of teeth do not make a lot of sense in the long-term. When endodontists tell that they can remove any broken file from any root, the answer to my question, “How much tooth structure is left?” is a far more important consideration than how elegant the gymnastics were to retrieve the file segment. Prosthodontists understand this because they frequently see over-prepped teeth come apart. Endodontists most often do not see these kinds of failures, so it can be more difficult for them to understand the restorative dentist’s dilemma. Fortunately, there are new voices joining my campaign to cut less dentin out of teeth during RCT. Clark and Khademi2,3 have taken it further with their understanding of where the strength of a tooth resides — in the cervical third of its root structure and crown. As a result, my molar access cavities have become smaller (Figures 1a-b). Thanks, guys. Figures 1. (a) Tiny access cavity cut through an IPS e.max (Ivoclar Vivadent) crown. Keeping the access small allowed the new all-ceramic crown to be retained with little aesthetic or structural loss. (b) Postoperative radiograph shows how the exit paths from mesial and distal canals intersected at the cavo surface of the access cavity, allowing minimal access size without compromise in convenience form. The most effective way to cut ideal but optimally conservative access cavity preparations is to spend the time (preoperatively) to plot an ideal access path to each canal, and to identify the occlusal landmarks that delineate that path. Once the pulp chamber has been successfully invaded, rotary negotiators are used to find each orifice, then using an extra-long guided-access bur such as the LAX diamond (SybronEndo) at half speed, the file paths are smoothed and straightened directly into each canal, thereby completing the access preparation. The most prevalent cause of over-done coronal enlargement is the lateral condensation (of cold gutta-percha) obturation technique. Without over-enlarging the coronal aspect of small molar canals, it is difficult to wedge more than one accessory cone beside a master cone; hence, the popularity of Gates Glidden burs. My biggest beef with lateral condensation is that we need more coronal enlargement; thus, we essentially reduce the structural integrity of the tooth to facilitate an obturation method scarcely more effective than single-cone filling. We can do better. The most effective way to maintain conservative coronal shapes is to use rotary files with .04 taper or with rotary files of greater taper having maximum flute diameter limitations, such as GT and GTX Files. Obturation methods that will work with these smaller coronal shapes are: single-cone filling, warm lateral condensation, warm vertical condensation, and warm centered condensation, as well as carrier-based obturation. Irrigating successfully through these smaller shapes is easily done with 30 Ga, safe-ended, irrigating needles. Endodontic failures can usually be fixed. However, nobody can fix structural integrity problems. Therefore, it is vital to cut less dentin during root canal procedures! 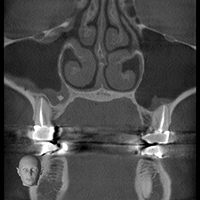 It is a truism that cone beam CT imaging (CBCT) has changed the specialty of endodontics forever (Figure 2). More so than the microscope, CBCT has allowed for the definitive diagnosis of endodontic failures, the number of canals present in a given tooth, and with the right machine, even lateral canal ramifications can be seen before treatment. Figure 2. Mesial view through the contralateral MB roots of these maxillary first molars reveals untreated MB2 canals in each root, with adjacent soft-tissue growth seen in the sinus spaces. I have always touted taking a mesial (radiograph) view of extracted teeth that have been treated by hands-on course participants, describing what is seen as the “secret life of root canals”; this view reveals all of the anatomic challenges that are normally hidden in conventional dental radiography views. Having CBCT imaging before commencing RCT is like being Superman with x-ray vision and a rotary file. You never have to go into a root again wondering how many canals you might find. The only negative issue I have noted with my CBCT machine (besides the lease payment) is when it definitely reveals the presence of an elusive MB2 or an MB3 canal during the access preparation. Without CT imaging, after 30 or 40 minutes spent risking perforation without finding an MB2, I have usually convinced myself it is not there. Those days are over the first time you turn it on after installation. 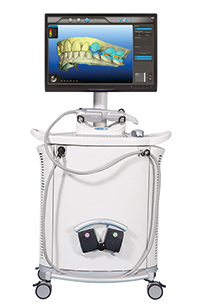 Do you need a $100K CBCT machine to do exceptional endo? Absolutely not; as proven by all the cases treated to the state-of-the-art with multiple angles of 2-dimensional x-ray imaging. However, I will say that it is not as easy, and definitely not as fun. CT imaging is essential when cutting minimalistic access cavities as canals are counted and located in computer space, obviating the need to cut larger access preps to view everything directly. Besides being one of the most satisfying experiences of my clinical career, training up to do implant surgery for the last 6 years has improved my endodontic skills. From my implant educators I learned the benefit of doing more specific treatment planning, the critical advantage gained by using drill guides, and I learned how to use long drills for endodontic access preparation when angulation is critical (Figures 3a-d). Figures 3. (a) This tipped molar has been beautifully restored upright, resulting in 16 mm of crown length from the mesial marginal ridge on the occlusal surface to the cervical margin of the crown. 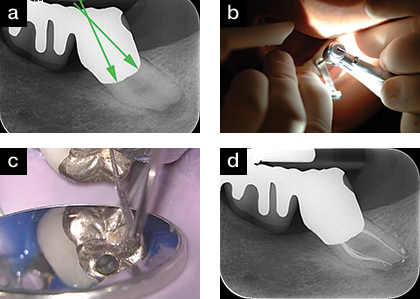 (b) After plotting an ideal file path to the mesial canals, a model-based drill guide allowed the initial drill to hit the MB canal orifice dead-on after cutting blindly through the mesial marginal ridge and nearly 16 mm of crown and tooth structure. (c) Treatment planning was confirmed as all canal orifices were located through this 2.5 mm access cavity. (d) This case was still complicated after the canals were located. They were initially negotiated with a 15-.06 VB file (DENTSPLY Tulsa Dental Specialties), but the severe apical curvatures necessitated hand k-files to reach length and rotary GTX (DENTSPLY Tulsa Dental Specialties) to finish. Note the apical bifurcation of the distal canal. Learning to place implants has also inspired new endodontic technique development. As soon as I experienced the elegance of using drill guides for implant surgery, it was an easy jump to envision drill guides for apical surgery; minimally invasive, rapid, and accurate (Figure 4). Figure 4. My experience using model-based and CT-based drill guides for implant placement was the inspiration to work with Materialise Dental to prototype the first CT-based Endodontic Surgery Drill Guide. I use a rubber dam to isolate extraction/graft sites so there is little or no contamination of the graft site. In addition, with a Nygaard-Ostby rubber dam frame, all the soft tissues are pulled away from the operative field (Figures 5a-c). Even with model or CT-based drill guides, I take a PA radiograph after each drill is cut to planned length. If I use 3 drills for a given implant placement, I have 3 opportunities to nudge my drill paths into progressively-truer paths. This is much easier than correcting after all 3 drills have been placed erroneously. Figures 5. (a) My endodontic methods have likewise improved my implant surgery. (b) By placing a slit rubber dam from tooth No. 15 (clamped) to No. 13 (flossed through the mesial contact), I had total control of the extraction, the upfracture of the sinus floor, and bone graft with a PTFE membrane (Cycoplast). (c) Healing at 2 weeks. Sutures are typically removed 2 weeks postoperatively, and the membrane (with cotton pliers) at 4 weeks. So, look for opportunities across lines of expertise. Cross-training has been good to me, and I highly recommend it to you. This technique does not work at all in theory but, ironically, it is awesome in practice. I came upon this departure from convention by using Vortex Rotary Files in the most aggressive manner that I could conceive. I pulled an extracted lower molar from DEL’s tooth bank (a jar), and I shoved the smallest Vortex File I had (a 15-.06) into the dry and never-instrumented MB canal with too much force. To my surprise, it cut to length! Thinking that it must have been a rare one-off occurrence (we all know rotary files should not be taken to length until hand k-files have established a “glide path”). But, as it turns out, canals in their natural state provide an excellent glide path given the right file, barring an apical impediment. The safest way to ease into rotary negotiation is to pick the right file and to just use it as an initial entry tool for small molar canals as a very sharp orifice widener. The 15-.06 Vortex Blue File is my favorite because its limited shape memory allows pre-bending along its length for easier introduction into mesial canals of molars. After using a 15-.06 VB file for initial entry 3 to 5 mm into the coronal parts of each canal, an LAX diamond guided-access bur (SybronEndo) is brought in to straighten and smooth the access line angles to each orifice. The access is then filled with a lubricating solution, and the 15-.06 VB file is brought back into each canal with its stop at estimated length (300 rpm, 150 Ncm torque limit). The intent here is to allow this instrument to cut deeper, but to never apply additional pressure when it slows in its apical progress; remove it instead. If the file is loaded with debris, clean it with an alcohol-soaked gauze, replace it in the canal, and see if it wants to cut deeper. If not, a No. 08 K-file is brought in and will typically plummet to length due to the coronal enlargement cut by the rotary file. If it keeps cutting apically, let it do so while being sure to clean the fill more often as estimated length is approached. Length determination during rotary negotiation procedures is accomplished by using the “long file probe” for my Root ZX Mini apex locator (J. Morita), as it easily rides on the shank of the rotating instrument as the file approaches estimated length. This is not for the inexperienced, nor the faint of heart; practice with extracted teeth is paramount, but the advantages are definitely worth the learning curve. I’m a bit late to this party, but after doing initial negotiation with a ripping-sharp rotary file, I realized that the 15-.06 Vortex Blue File I was using was also doing a rough-cut of the canal shape, making the apical preparation with radial-landed GTX Files much more efficient (Figure 6). My time to complete negotiation to final shape has dropped by 50%, and I’m seeing more lateral canals and fins than any time in my career. Figure 6. All canals in this mandibular molar were negotiated to length with a handpiece-driven 15-.06 rotary file, before any hand files were used. Note the large ropelike canal between the mesial canals and the apical bifurcation of the MB canal — evidence of effective debridement. Figure 7. Above is the 15-.06 Vortex Blue File — wicked sharp and safe in small tip sizes. Below is a 40-.06 GTX File with radial-landed blades for safe apical shaping. Nonlanded rotary files are relatively safe in small tip sizes; however, I would not recommend using them with tip sizes larger than ISO No. 15, as apical transportation may result in curved canals (Figure 7). One of the serendipitous outcomes of my foray into rotary negotiation was that I began seeing a significantly greater number of lateral and accessory canals filled in the teeth I began this way, leading me to understand that I was previously burnishing cut debris into the orifices of lateral canal projections with hand K-files used during negotiation, and with landed-blade files during initial rough out of the final shape. Once I was onto that track of thinking, I realized that cut dentin debris was a serious opponent to adequate irrigation and cleaning the secondary parts of root canal systems. As a result, I then changed my irrigation routine to using Q-Mix (DENTSPLY) or 17% aqueous EDTA exclusively during shaping procedures. This was done with the hypothesis that removing the smear layer as it is being created may be a more effective way of clearing the way for optimal efficacy of the necessary sodium hypochlorite irrigation to follow. Figures 8 a-b. This was done in a single visit as a live demonstration. Note the symmetry of the radiolucency about the 5 to 6 portals of exit, and the narrow shapes through which the lateral canals were irrigated and obturated (effectively, it seems). Seemingly, there has been a greater number of lateral canals filled under this new regime; even when used in canal preparations that are more conservative both coronally and apically (Figures 8a-b). With the introduction of the latest generation of digital impressioning scanners, the final inflection point toward a fully digital laboratory process has arrived. Having drill guides, provisional crowns, and temporary and final abutments CAD/CAM-manufactured is the bee’s knees, so I have an iTero (Cadent) digital impressioning scanner on my 2012 Christmas wish list (Figure 9). Being able to email my impressions to a lab? Nice. Editing your lab tech’s crown and bridge designs by computer? Cool. Not having my patients almost hurl while we wait for impression materials to set? Priceless! Practicing on extracted teeth is always beneficial, but every one of them has different anatomy, so dentists must depend on luck of the draw to find extracted teeth with the full-range of classic anatomic challenges; an exceedingly rare outcome. They need to practice on relatively straight canals with large and small apical diameters, all the different types of canal curvatures, all the types of natural impediments, etc. Unfortunately, even when a student finds an extracted tooth with the perfect anatomic challenge he or she wishes to practice with, it is a one-off experience with no opportunity to try it again if the first attempt is less than ideal. Figure 9. iTero (Cadent) Digital Impressioning Scanner. Figures 10. (a) Clear replica of CT-reconstructed anatomy. (b) The anatomically-correct apical form seen in these replicas introduces students to the concepts of “visual imaging” and negotiation of accessory canals. Students practice on multiple replicas with identical anatomy until unconscious competence is achieved. The CT-based training replicas have solved this conundrum (Figures 10-b). It took 23 years after its invention for Dental Education Laboratories to successfully marry our mCT imaging of endodontic anatomy with 3-dimensional printing technology. Hands-on training will never be the same! Rather than every student having a different anatomic challenge hidden in his or her extracted teeth, now, all of them can work in the same clear anatomic form together. Furthermore, educators can lead a whole class through each of the classic endodontic challenges instead of teaching a single student at time. 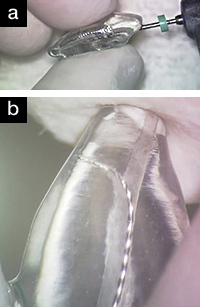 With tooth replicas, students can practice a given challenge as many times as they need to achieve competence in that root form, after which they can be tested in a nontransparent replica having the same anatomy. Training replicas allow for complete standardization of grading; this is not a small problem in dental schools. Anatomic replicas now make it possible for dentists to do distance learning in a hands-on format, and Dental Education Laboratories has developed remote training modules for dentists to work through in their own operatory. This can be done with their own assistants, all led by interactive video footage that can be watched on computer, iPad, or phone. Fun, huh? Everything has changed, except the anatomy of teeth, their roots, and the root canal passageways that course through them. Therefore, we must become students of endodontic anatomy. Students of endodontic anatomy know that their clinical success is largely dependent on their ability to treat root canal systems to their full apical and lateral extents; they know how to choose files to match the canal form they are in but, most of all, they expect everything going forward to change except the anatomy. Rud J, Andreasen JO, Jensen JF. A multivariate analysis of the influence of various factors upon healing after endodontic surgery. Int J Oral Surg. 1972;1:258-271. Clark D, Khademi J. Modern molar endodontic access and directed dentin conservation. Dent Clin North Am. 2010;54:249-273. Clark D, Khademi JA. Case studies in modern molar endodontic access and directed dentin conservation. Dent Clin North Am. 2010;54:275-289. Dr. Buchanan is a Diplomate of the American Board of Endodontics, a Fellow of the American and International Colleges of Dentistry, and is on the part-time faculties of the graduate department of endodontics at the University of Southern California and University of California, Los Angeles. He is the founder of Dental Education Laboratories, a hands-on teaching lab in Santa Barbara, Calif, and 2010 marked his 30th year of a career dedicated to endodontic practice, teaching, and development of new endodontic tools and techniques. He has also won international awards for his video and DVD content. Disclosure: Dr. Buchanan has a financial interest with DENTSPLY on the GT and GTX systems, LAX burs with Sybron Endo, and J. Morita’s mini apex locator.